But is it possible to have two distinct stages of release from a single chemical layer? In short the answer is yes and this article is aimed at explaining the two stage release mechanism. Graphic depiction of the VinguardTM two stage release mechanism. The Vinguard sheet is constructed in such a manner that moisture can only penetrate the matrix from one side as the matrix is effectively shielded from moisture on the other side by the moisture impermeable polyester film. Once the Vinguard two stage SO2 gas generating sheet comes into contact with the high levels of humidity found inside the packaged grape carton the release of SO2 gas is triggered. 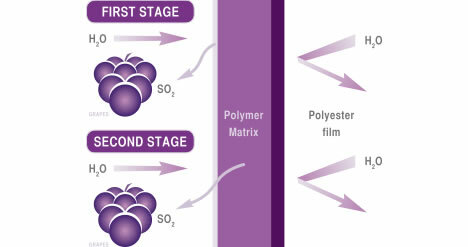 Moisture comes into contact with super fine crystals embedded in the surface area of the polymer matrix and through a chemical reaction SO2 gas is formed and immediately released into the grape carton. The specific position of the crystals on and close to the matrix surface, combined with the large surface area ensures that a quick release of SO2 gas is achieved. This quick peak of gas is considered essential to surface sterilise the berries and stop Botrytis cinerea development. Although an initial peak of SO2 gas is considered to be essential, it should be noted though that exposing grapes to elevated concentrations of SO2 gas over extended periods of time can lead to bleaching and a loss in fruit quality. Therefore it is essential that the duration of this initial peak is less than 24 hours by which time the level of SO2 gas inside the grape carton should be below 20 ppm. As moisture penetrates deeper into the polymer matrix more SO2 gas is constantly formed inside the matrix and released into the grape carton. Since the moisture penetrates the matrix fairly slowly SO2 gas is released at a constant rate and at much lower levels than the initial peak for a period up to ten weeks. By manipulating the composition of the polymer matrix the tempo at which moisture penetrates the matrix can be altered thereby effectively changing the rate of SO2 gas release. This is one of the most unique aspects of the Vinguard technology enabling Vinguard to tailor make SO2 gas sheets to suit any client’s requirements globally.